The Space Virgin Arts Collective is a 501c3 non-profit arts group with the mission of building community through collaboration. 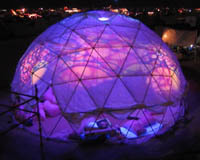 We started as a Seattle-based Burning Man theme camp in 1994, but we have since grown and our projects include off-playa art projects and events. 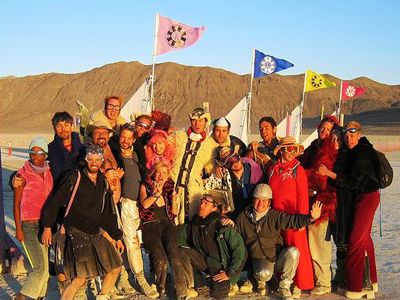 In keeping with the Burning Man philosophy "no observers, only participants", our art is often interactive and experiential, plunging participants into theatrical-style sets and engendering joyful, transformative experiences. In addition to more traditional art projects, we have raised the simple act of party-throwing to an art form, staging events with stunning atmosphere, exuberant dancing, live performances, and a host of interactive happenings. We are an eclectic group with diverse talents. The group's membership grows organically through personal connections, helping us maintain our sense of friendship and community. If you are interested in becoming involved, get to know us! Talk to your favorite Space Virgin or come to our events and meet us! If you'd like to hear more about our upcoming events or keep abreast of our doings, drop us an e-mail at info - at - spacevirgin.org.